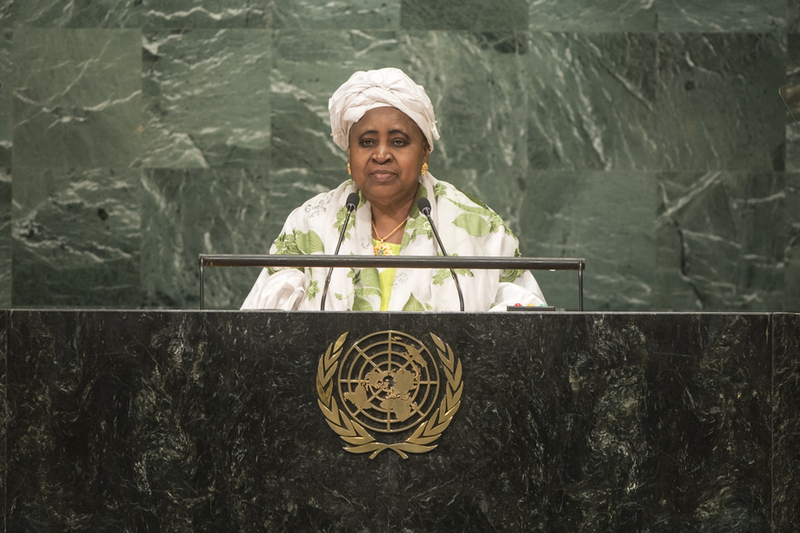 ISATOU NJIE-SAIDY, Vice-President and Minister for Women’s Affairs of the Gambia, said the world was at a crossroads and wars had intensified in the Middle East, the Horn of Africa, and elsewhere. “History will only judge us kindly if we are magnanimous and devoted to the welfare of our people,” she said. It was past time for Israel to heed the overwhelming international consensus for a two-State solution as the only viable solution to the Palestinian issue. The threat of terrorism undermined the fragile peace the world enjoyed, but this was no excuse for certain “rogue politicians and pseudo-intellectuals” to use the actions of a few to create a clash of civilizations between Islam and the West, or Islam and the other Abrahamic religions. She added that it was necessary to focus not just on security but global economic conditions as well, and a world of zones between the affluent and the poor could not be stable. Her country had made significant progress on the Millennium Development Goals, including eradicating hunger, and welcomed the theme of this year’s General Assembly, the Sustainable Development Goals. Africa was losing its young population because of migration, with thousands perishing at sea and many more languishing in detention centres in Europe. International cooperation to create jobs to keep young Africans at home was needed. Turning to Security Council reform, she said it was necessary, as the current composition was undemocratic and akin to minority rule. It was an anachronism for five countries with the veto to dictate the political and economic agenda of the world. Her country renewed Africa’s legitimate demand for two permanent seats with the veto, and also expected the next Secretary-General to represent the people of the world, not just the Permanent Five. Finally, she said that a failure to address and settle the age-old injustices of slavery and colonialism were responsible for many of the problems in the world. Her continent had been plundered and pillaged and its citizens forced to build Western nations while facing discrimination. Yet some questioned the merits of reparations. Such restitutions had been paid by many countries, including by Germany, Japan and the United States, while Iraq had paid reparations to Kuwait. “Why then should Africans and people of African descent be ineligible for reparations?” she asked. The African Group at the United Nations had prepared a resolution on slavery which would be tabled, and all nations were encouraged to support it.